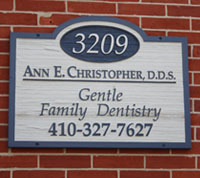 Welcome to the website of Dr. Ann E. Christopher DDS. We are very excited to meet you! Established in 1991, we have been an active part of the community since the beginning of the re-growth in the Canton area. Located east of downtown Baltimore, we are close to two Johns Hopkins campuses. There is nothing we love better than meeting the needs and expectations of each individual patient, whether it is maintaining a healthy smile or helping a fearful patient to have a successful experience by providing each one with a safe, comfortable environment. Please feel free to browse our site. Call us with any questions or if you wish to schedule an appointment. We will provide our patients with a level of service that exceeds their expectations. We will provide work of such high quality that it will challenge the standards of the profession. We will contribute to the welfare of the community, both as a practice and individually. We will continue to invest in the finest technology and education in anticipation of the needs of our patients. We will conduct business in a fair and professional manner. We envision dentistry as a critical way in which we are improving the oral health and overall health of the patient. It is not just a procedure. It is our goal to be the best provider of dentistry. It is that simple. Our standards reflect that goal. Dr. Ann E. Christopher D.D.S.